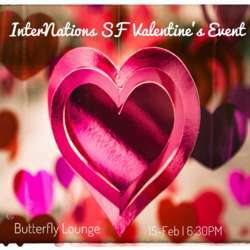 Single...Married...Divorced...It's Complicated... Whatever your status, you are invited to join us at Butterfly Lounge for our InterNations SF Valentine's Event. It promises to be an evening for you to catch up with expats you know, to meet new ones who are fresh to the group, or just to enjoy the elegant ambiance of Hotel Majestic Butterfly Lounge, a refined yet casual bar that has been a staple in SF since the early 1900s. With a mix of business suits and hipsters, friendly staff, moderate prices, and signature cocktails, The Butterfly Lounge is the perfect place to network with friends and other expats. As always, Alexandra and I look forward to seeing you on Friday, 15 February!